We've made a lot of progress when it comes stopping polluters from spoiling our rivers. We didn't give the Potomac River an improved health grade for nothing. But there's a reason why our children still cannot safely swim in the Potomac River and fishermen are cautioned against eating their catch: There are still plenty of legal ways to pollute our rivers. But knowledge is power! Learn five ways* pollution is legally entering our waters and what you can do to right the course for the Potomac. *We left out one egregious example: Billions of gallons of raw diluted sewage enter the Potomac River every year through Combined Sewage Overflows (CSOs). While it is legal for now, DC Water is cooperating with the EPA and will eliminate nearly all CSOs by 2030. Every day, we lose 100 acres of forest in the Chesapeake Bay region to development and gain new plazas, parking lots, and housing developments. We need places to live and shop, but we also need outdoor areas to enjoy on the weekend and forests to keep our drinking water sources clean and safe. The barren land left in the wake of bulldozers is ill-equipped to absorb rainwater, creating excessive runoff that pollutes our drinking water sources, spoils fishing grounds, and destroys wildlife habitat. Pollution from urbanization is so bad that it is now the only source of pollution on the rise in the Potomac and Chesapeake Bay. Clean water solution: Forested land produces the cleanest waters to our rivers. Protecting large swaths of forests will be critical to safeguarding water quality in the Potomac and Chesapeake Bay. Urge city planners to create forward-thinking conservation plans and support Potomac Conservancy and other land trusts who work with communities to permanently protect riverside forests. Learn how Potomac Conservancy worked with one in community in West Virginia to save a 1,700 acre forest from development at potomac.org/whitehorse. Photo from the Chesapeake Bay Program,. 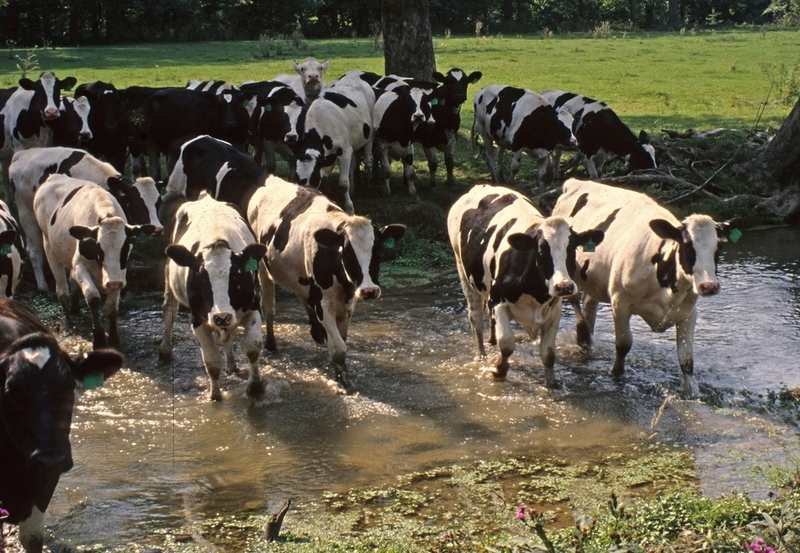 It may sound nice to allow cows to splash around in streams, but it’s actually not good for their health or the health of your water. When cows are allowed access to creeks and streams, they spread disease, hormones, e-coli, and other bacteria through their feces. That means more sick cows, especially vulnerable calves, and more pollution in our waters. Polluted runoff from agricultural lands, including cow and chicken feces, remains the single largest contributor to pollution in the Potomac River and the Chesapeake Bay. Clean water solution: Farmers can keep their cattle healthy and our waters safe by fencing off streams and using water troughs to keep their animals hydrated. Several state and federal programs fully cover the costs of installing these measures, called best management practices (BMPs). Potomac Conservancy works one-on-one with small family farms to provide landowners with the expertise and resources they need to install BMPs and keep pollution out of upstream waters. Learn how you can support our work and prevent agricultural pollution flowing downstream to your community at potomac.org/lands. Just 45 miles upstream from our nation’s capital, developers in Loudoun County, Virginia, can legally cut down trees along the Potomac River and local streams. Without legal repercussions in the county, Trump National Golf Course was allowed to clear cut 1.5 miles of trees along the Potomac! Bare, eroding shorelines dump harmful runoff and sediment into our waterways, ruining nearby fishing grounds and polluting the Potomac River, the source of drinking water for you and nearly 6 million residents. Clean water solution: Trees are nature’s best Brita filters. They help control polluted runoff by soaking up excess rainwater, filtering out land-based pollution, and stabilizing stream banks with their root systems. Their shade keeps water temperatures cool and they provide important habitat for fish and local wildlife. Stripping trees and natural protections along waterways is illegal in most jurisdictions, but Loudoun County’s elected leaders deem it acceptable. Stand up for clean water and urge your local leaders to protect tree buffers along our streams! Keep tabs on the Potomac River and clean water news at potomac.org/river-update. Photo of suburban maryland by David Wilson. As the region makes room for 2.3 million new residents, sprawl is creeping into rural areas and paving over agricultural and forested lands at a rapid pace. When city leaders and planners sign off on sprawl, it leads to shrinking forests, weakened natural flood protections, and greater pollution levels in our local streams and rivers — not to mention increased traffic, larger school classroom sizes, and higher cost of living. This spells bad news for our waters. Polluted runoff from expanding urban areas is the only increasing source of pollution to the Potomac River and Chesapeake Bay. Clean water solution: Tell your local decision-makers to say no to sprawl and yes to river friendly growth! By embracing smart planning approaches, communities can responsibly manage growth and protect healthy lands and waters. Urge your local elected leaders to support clustered areas for mixed-use development, protected zones for forested and public lands, and affordable nature-based solutions that improve local water quality and beautify communities at the same time. Read more about river friendly growth. Photo of Trash at Kenilworth Park and Aquatic Gardens from the Chesapeake Bay program,. Littering is actually illegal in many places (thankfully), but you wouldn't know it from the damage wrought by irresponsible river users. Small pieces of trash and litter amount to enormous pollution found in our local waters. During Alice Ferguson Foundation’s 2016 Potomac Watershed Cleanup Day, volunteers across the region removed over 334,000 pounds of trash. That’s the equivalent of removing 25 African elephants worth of trash from the Potomac! And litter’s harmful impact goes beyond displeasing aesthetics. It leaches toxins as it breaks down, puts wildlife in danger, disturbs water flow in small streams, and costs local jurisdictions tens of thousands of dollars annually in removal efforts. Clean water solution: On your next outdoor adventure, do the Potomac a solid and bring a reusable water bottle, pick up your dog toys, and collect and remove trash that you bring with you. If you want to go the extra mile, come get your hands dirty for clean water! Join hundreds of volunteers by participating in a local trash cleanup. Sign up for an upcoming event today at potomac.org/events.